Languedoc Food - a serious subject! Home > Essential Info > Living in France > Languedoc Food - a serious subject! Lying in the very centre of France's south, and incorporating a long stretch of Mediterranean coast, in addition to mountains, plains and valleys, Languedoc-Roussillon (Languedoc-Roussillon Property Guide) is a region which takes its gastronomy seriously. It is, after all, one of the largest wine producing regions in Europe, and thus requires a cuisine capable of soaking up all that wine! Seriously, though, the gastronomy of the Languedoc region is both unique and delicious. If you are in any doubt, ask the famous chef John Burton-Race, who chose to live and cook in the region for a year of his life, or perhaps Rick Stein, whose epic culinary journey down the Canal du Midi also led him to spend a good length of time enjoying local food (Buying and cooking French food). The cuisine varies throughout the region, with each department offering up its own flavours and textures to tantalise the palate. Take a trip around the departments to discover just a little taster of what makes this one of the most flavourful regions in France. The department of the Aude is often said to have the least exciting gastronomy of the five departments, but for those who know the Aude well it seems an undeserved reputation (Aude Property Guide). The Aude actually has a very proud gastronomic tradition (one which has drawn numerous celebrity chefs to spend time here), and you need to look no further than the most famous of French stews, the cassoulet, which originates in the Aude, to prove the point. Duck is extensively used and appears in many guises with duck confits, duck breast (magret) and duck gizzard salads all being popular. The cassoulet, essentially a hearty stew of white haricot beans (locally gown of course, nothing else will do), duck confits (oil preserved), Toulouse sausage and crispy duck or goose fat to top it off, is one of the most fought over dishes of the south of France. Fierce arguments rage as different towns lay claim to being the birthplace and spiritual home of this revered dish, but the crown is generally accepted to go to the otherwise unassuming town of Castelnaudary (Castelnaudary Property Guide), which lies on the Canal du Midi. Legends abound regarding the origins of the dish, but one of the more colourful is that the town, besieged by the English and facing defeat, gathered up all the local ingredients they could to make a fortifying meal for their people the night before the battle. They came up with the cassoulet, which was so effective that the battle was won, the English defeated and the town was free. No wonder it is celebrated! 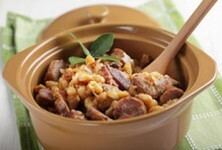 It is, in fact, so celebrated that there is a week long festival held every August in honour of the cassoulet. The Narbonne (Narbonne Property Guide) area of the Aude is notable for its wonderful shellfish, and the salt lagoons that are the natural barrier between land and sea in this part of the region are a rich source of mussels and oysters. There is hardly a restaurant in this area where you will not find mussels on the menu, usually in the traditional form of a cheap and cheerful (but sublimely tasty) Moules Frites. From the Montagne Noir near Carcassonne (Carcassonne Property Guide), comes the sanglier, or wild boar, enthusiastically hunted during the winter season and served as a regional speciality. Elsewhere in the Aude you will find olives (the revered Lucques variety), apples, honey and goats' cheeses. Lozère (Lozère Property Guide) is the "odd man out" of the region's departments, in that it has no Mediterranean coastline, and is by far the most northerly department, lying on the southern end of the Massif Central. It has, therefore, more in common with its neighbouring areas of Aveyron (Aveyron Property Guide) and the Auvergne (Auvergne Property Guide) than it does with the Aude, the Pyrénées-Orientales, the Hérault and the Gard. Its gastronomy is less likely, obviously, to involve seafood, although it does offer fresh water fish such as trout which are an important feature of its cuisine. Specialities from this department are typical of the mountainous parts of France, with nuts, truffles and cèpes from the forests and pastures, frogs (legs only are eaten!) and trout from the rivers and lakes and cheeses from goats, sheep and cows. Aligot - don't even think of the calories! The Lozère's real claim to culinary fame is the fabulously rich Aligot, a dreamy concoction of mashed potato, crème fraiche, cheese and sometimes garlic. Aligot is made in the traditional way with giant wooden paddles, an art often demonstrated in the department's markets and which always draws a crowd of onlookers as well as buyers. A word of warning, though, Aligot is one of the most divine things you will ever taste, but it has a calorie count that will give any dieter nightmares for at least a month! Another Lozère speciality, for the meat eaters this time, is a herb pie, made with local sausage, wild herbs, pork and puff pastry. Meanwhile the Lozère is a natural habitat for all manner of funghi, and the tastiest varieties of mushrooms such as cèpes (porcini ) are used to make a rich and delicious fricassée, with the simple additions of butter, garlic, lemon juice and parsley. The Gard (Gard Property Guide) is the most easterly of the Languedoc departments, and is neighbour to Provence (Provence-Alpes-Côte d'Azur Property Guide). It has a short but important run of Mediterranean coastline, and it is here, at its south-eastern reach, that it takes in part of the marshy flat land known as the Camargue, home to a unique ex co-system and bringing with it an equally unusual gastronomy. The city of Nîmes is the principal city of the department, and this town is notable for several dishes. The presence of the Mediterranean calls for many seafood and fish recipes to be popular here, while elsewhere beef from the Camargue black bulls is widely celebrated, and olives form the basis of several delicacies. Brandade de Morue, is a wonderful salt cod cream which comes from the city of Nîmes (Nimes Property Guide). Nîmes lies inland in the Gard, and so developed the dish to make the most of salt cod rather than fresh fish. The recipe involves crushing salt cod and olive oil together with herbs with a pestle and mortar, and is served as a delicious dip, perfect for aperitifs or party nibbles. The unusual red rice from the Camargue is another Gard speciality. Its rich, red colour makes it a striking accompaniment to any dish, and it goes particularly well with a beef stew made from the meat of the local black bulls, which are an iconic symbol of the area. The powerfully flavoured beef is slow cooked with red wine to produce a flavoursome stew. Tapenade is a favourite aperitif food, and also frequently appears on tapas style menus. To produce tapenade, olives (of either colour) are crushed with anchovies, garlic, spices and herbs to make a smooth paté. The Hérault (Hérault Property Guide) also has an extensive Mediterranean coastline, and this has a predictable effect on the gastronomy of the department. Like its neighbour, Aude, the Hérault is home to Etangs, or salt lagoons as well, as to the Mediterranean beaches and waters, and so produces both fresh sea fish and also superb mussels, eels and oysters. Inland, the olive trees flourish in the hot, Mediterranean sun, aromatic herbs grow wild and the Cevennes Mountains provide yet more natural ingredients for the department's cuisine. A speciality of the exquisite fishing town of Sète (Sète Property Guide), this is a tasty and elegant monkfish stew. Other fishy delights from Sète include a black risotto made with squid ink, octopus pie and mussels with squid. Meanwhile La Petite Paté de Pezenas is a pie made with mutton from the sheep that graze the scrubland on the high hills and mountains of the inland Hérault, the meat carrying the distinct aroma of the wild herbs eaten by the sheep. As a dessert, the pastry and chocolate dish Chocolate Croustade, also from Pézenas (Pezenas Property Guide), takes some beating for chocolate lovers. Last but in no way least, is the Pyrénéles-Orientales department (Pyrénées-Orientales Property Guide). This part of the Languedoc-Roussillon (the Roussillon part), is a law unto itself, culturally, scenically and gastronomically. In many ways, being Catalan to the core, the gastronomy has more in common with north-eastern Spain than with southern France, although there is, of course, a cross over of culinary ideas in evidence. The department is the most southerly, and runs along the Mediterranean coast right up to the Spanish border, taking in the glorious Pyrénéan Mountains along the way. The Catalan dishes of the Pyrénées-Orientales are flavoursome, frequently using fish and shellfish, and also exuberantly colourful. Many people are as divided on their opinion of anchovies as they are over Marmite, that British spread which is said to divide people into two camps: those who love it and those who hate it. Anchovies are a speciality of the Pyrénées-Orientales, and most especially, of the beautiful fishing village of Collioure (Collioure Property Guide). Many anchovy dishes are served around Collioure, and often surprise tasters as the freshly prepared anchovies are far less salty and bear little resemblance to tinned ones. Pissaladière is a delicious pizza style dish made with anchovies, olives and capers. Don't reject paella as being a Spanish only dish, as it is quite at home in Catalan France too. Made with the local fish and shellfish, Catalan paella is a favourite for fetes and festivals, as well as for any party that takes place outdoors on balmy summer nights. Another speciality, Boules de Picolat, is a dish of white beans and meatballs, and is a Catalan take on the more common Italian meatballs and spaghetti. Meanwhile the Queen of Languedoc desserts, Crème Catalane, is the Pyrénées-Orientales answer to the French classic Crème Brulée. Flavourings include fennel, vanilla and lemon. As you travel around the Languedoc tasting the speciality dishes from the different departments and areas of the land and sea, you can see that the gastronomy is a product of the natural riches of the region. The Languedoc is not a wealthy part of France, as is Provence, but this is often the driving force behind the tastiest of cuisines, as people were driven to make the most of easily obtained natural ingredients, resulting in one of the healthiest, most delicious selection of dishes in the country. With mountains, pastures, fertile soils, salt lagoons and the Mediterranean Sea at its disposal, not to mention a superb climate, the Languedoc-Roussillon region is proud to present its gastronomy, which it believes stands up against any you wish to pit against it!